Youth Arts Education Workshops - Bring out that creative spark in your young artist at t he Youth Arts Education Days this summer at the Festival of Arts. Kids will enjoy art classes taught by professional Festival artists in mixed-media, jewelry making, collage and more. Meanwhile, parents will have free time to view the artwork on display throughout the Festival grounds. Festival artists will also share some of their creative techniques in a fun and friendly environment! For children ages 5 - 12. Club Z! music instructors provide children and adults of all skill levels (beginner through advanced) private, personalized instruction, right in the home of their student. Their music tutors are experienced instructors inspire students through patient instruction. Tutoring is available in almost all musical instruments including piano, guitar, wind, string and percussion instruments. Club Z! can also provide voice lessons. Learn to play an instrument in a professional studio! 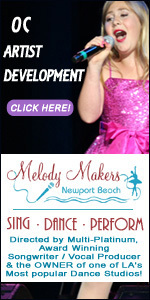 Melody Makers Artist Development Program offers instruction in many different types of instruments including piano, guitar, saxophone, drums and more. From beginners to experts - learn from real industry professionals to use chords, rhythm and style. Weekly lessons and private instruction available. Providing underprivileged kids with a chance for greatness! Musical Mentors is and educational outreach program created for underprivileged children. Their goal is to provide these kids with a true chance for greatness through music education and effective mentors.